It’s been a hectic few weeks around here and I feel like maybe the ticking of the clock is stuck on full-speed-ahead. Today we’re actually home. As in, not somewhere else!! Woo hoo! Isn’t that the best feeling in the world when you’ve been gone so much you forget what it’s like to stay standing in one spot? I am rather proud of myself, in the pile full of mounding chores, I have gotten quite a bit done today. The garage now has some breathing room, the furniture has been shifted around, the laundry isn’t jumping out its basket anymore, and even the toilets are smiling. Still there’s a billion more things I should be getting done, but honestly, all I want to do is stop and breathe-in these last few hours of September. So, instead of checking another “to-do” off the never ending list, I decided to take Sandy’s advice. Recently, I wrote about all the zinnias that came from one package of flower seeds and she asked if I use them as cut flowers. I just went out and cut some. Aren’t they pretty? Thanks, Sandy! Well..looks like I may have spoken too soon about this being a stay at home day. My little Superman just appeared all decked out in his costume, raring to go save the world! So, we’re off once again! I just wanted to check in with you and tell you I hope you’re having a wonderful day. I like the way the flowers look in the pitcher. Great idea. Have a great weekend. Now you get to enjoy those beautiful zinnias inside, as well as out. They are perfect in that pitcher! You are welcome. Yes, those pitchers are cool retro! Aw! How nice of you to first of all, read my posts. And, secondly to say you’re a big fan! I am beyond honored! Truly, thank you so very much! 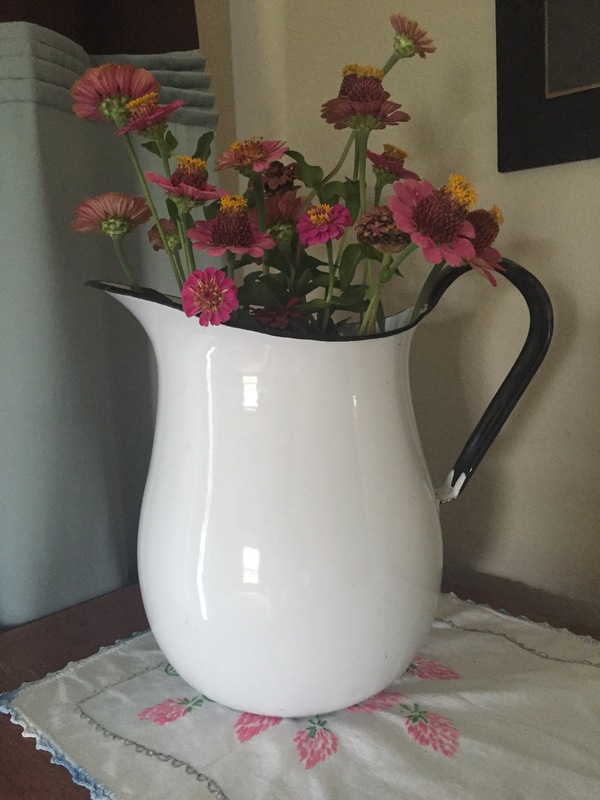 Beautiful flowers and arrangement and I love the pitcher! Hi. Thanks so much. I have it sitting on my parent’s oak bookcase, next to a picture of me and mom when I was a baby. Looks right at home there. I’m glad that you take the time to cherish the last day of September and to drop everything when LB shows up in his Superman. Such beautiful weather, enjoy the weekend! Oh!!! I love your idea of moving them from room to room! AND putting them in front of a mirror! Thanks for that idea! I just moved my small vase to the bathroom! Yes, Superman was quite a surprise. He’d been reading his comic books and suddenly was dressed and ready for an adventure! I’m trying to savor age 9. Ten is coming faster than I ever expected it to! I’m glad you like the zinnias. I really like them because in the spring when we were at the store buying garden seeds, I told Little Bit he could pick any flower seeds he wanted and he chose those. Keep chasing the little man super sis, it’ll keep you healthy! Oh my gosh! He was a climber? Oh yes…we had to secure bookcases against the wall!! There came an age when he finally realised he wasn’t Spiderman and I could feel his disbelief and sadness…some things a mother just can’t fix! Your flowers are so very pretty in that container!! Have fun on your journeys with your little Superman!!! Life is so much fun when you join in the excitement of saving the world :). You made me smile SOOOOO BIG! 😊 You’re right, nothing beats being invited to be a super hero! You know what’s funny? While on our adventure yesterday, we went to McDonalds and Superman/ Super Girl are the happy meal toys! I don’t know who was more excited! My grandkids were here this weekend and when the nearly 3 year old came in she was wearing her “wunner woman” crown. And the 5 year old had his batman toy. We were super heroes all weekend as well! What a lovely photo that made me smile Jess. Hi Miri❤️ Wish you were here! That sounds awesome. I used to do that with my kids too! Being at home is nice, eh? No matter how many chores await, I love it when I don’t have to leave the house for a day or two. Two girls can dream, right? If we’re dreaming, let’s forget clean cake! Give me the full fat, sugary version instead! Yes, please. Real sugar, real fat! Yes!! And FROSTING! With roses and colors! And, mints!